Please see our How to Help page for info on how you can contribute to the “Save the Inn” fund or join the Charles Fletcher Society. The Earth Day Cleanup and work party will take place the morning of the 12th. We’re hoping to have another large crew from the California Conservation Corps there to help out local volunteers. Tasks include trash pickup along the beach and river, invasive species removal and control focused on pampas grass and English ivy, vegetation clearing, and maintenance/repair tasks to the historic Inn and Mill House. All volunteers must sign a release form, and children under the age of 18 must be accompanied by a parent or guardian. Please come down for the morning to help tackle the list of simple to challenging tasks, enjoy the bbq with other volunteers, and a walk on the beach. Navarro-by-the-Sea Day will take place on Saturday, June 9th, 2018 at Captain Fletcher’s Inn. “Uke Jam” on the Front Porch from noon to 1PM - bring your uke! Come on down to the Inn on June 9th and enjoy the afternoon at the beach with food, music, and fun. BBQ will be served all afternoon from our new grill, with a selection of hot dogs, sausages, hamburgers, and veggie options, with sides of slaw, pasta salad, pickles, chips, and watermelon. Along with delicious homemade cakes, cookies, bars and other treats. Serving local beers, hard cider, wine and non-alcoholic beverages from the original bar. And amazing Silent Auction Items from local businesses and supporters, including fine local wines and beers, certificates from local restaurants, and assorted treasures. Bring your uke for the “uke jam” from noon till 1PM, or just come and listen to the line up of talented performers all afternoon while you enjoy lunch and tour the Inn, featuring the mesmerizing Gwyneth Moreland and other amazing talent. The 7th Annual Navarro-by-the-Sea Day was held on Saturday, June 10, 2017 at the historic Captain Fletcher’s Inn. Free tours of the historic Inn and Mill House were led by Parks interpreter Paige Casalego all afternoon. Quilts made by Char Saunders were on display inside the Inn. Musical entertainment include a “uke jam” from the front porch of the Inn, followed by an amazing line-up of musicians, including sets by Pattie & Janna, John Bush, Marcus McCallen, and Jon Faurot. Visitors enjoyed BBQ served all afternoon from our new grill, along with delicious homemade treats, and local beers, hard cider, wine, lemonade and soda served from the original bar in the Inn. Silent Auction Items from local businesses and supporters, included fine local wines and beers, certificates from local restaurants, and assorted treasures. Funds raised will be used to continue our progress in completing the renovations of the Inn. Earth Day Clean Up. Lots of progress was made at our seventh annual Cleanup Day held on May 20th, 2017 at Navarro Beach, Captain Fletcher’s Inn and the Mill House. As in past years, volunteers and crew from the California Conservation Corps helped remove invasive plants, cut vegetation along roadways, remove sapling eucalyptus, and complete maintenance and repair tasks to the Inn and Mill House. A free bbq was served to volunteers at noon, supplied by Savings Banks of Mendocino. Thanks to all who helped out! Holiday Open House was held on December 3, 2016. We had a fire roaring in the restored fireplace, hot drinks and home baked treats to share. A selection of holiday ornaments, t-shirts, and note cards available for a suggested donation. The Gloriana Holiday Carolers serenaded us. 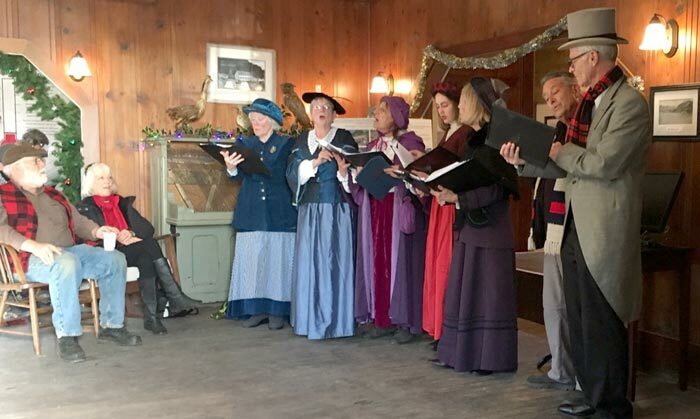 The Gloriana Holiday Carolers at the December, 2016 Open House. Summer Opening to the Public. For the first time in over 30 years, the Inn was open to public visitors by volunteer docents on select weekend days. Visitors got to tour the inside of the Inn, see our continuing progress, and enjoy the beautiful paintings by Katie Lewis and photographs by Sharon Garner, both local artists. Water, soda, snacks and ice cream were available to visitors for a donation. Special thanks to volunteers Tony and Alon, Marilyn, Jane and Katie, and Jim Martin for keeping the Inn open to the public. Navarro-by-the-Sea Day was held on Saturday, June 11, 2016 at historic Captain Fletcher's Inn. Free tours of the historic Inn were given from noon to 4 p.m. A fundraising dinner and concert were held in the evening. Paintings by Katie Lewis and photographs by Sharon Garner were displayed throughout the Inn, and remained on display through the summer for visitors to enjoy. Jim Martin, NSCR President, recapped some of our most recent accomplishments: the installation of an ADA compliant ramp; new fireplace insert and restoration of second-story historic windows by Lori Kaye. Marcus McCallen and Jon Faurot share soulful songs at our June 11, 2016 event. Kathleen Cameron, NSCR Secretary and President Jim Martin admire the newly installed fireplace insert and restored historic brick hearth — June 11, 2016. Earth Day Clean Up. NSCR accomplished a long list of projects on May 21, 2016, our sixth annual Cleanup Day held at Navarro Beach, Captain Fletcher’s Inn and the Mill House. As in past years, many volunteers, along with a hard working crew from the California Conservation Corps, helped remove invasive plants, wash windows, remove modern wallpaper, strip the downstairs floor in the lobby of the Inn, paint walls and doors, and so much more. A free bbq was served to volunteers at noon, supplied by Savings Banks of Mendocino. Thanks to all who helped out, including NSCR Board members Jim Martin, Pete Kalvass, Ericha Heinsohn-Sevy, Charlotte Saunders and Kathleen Cameron. 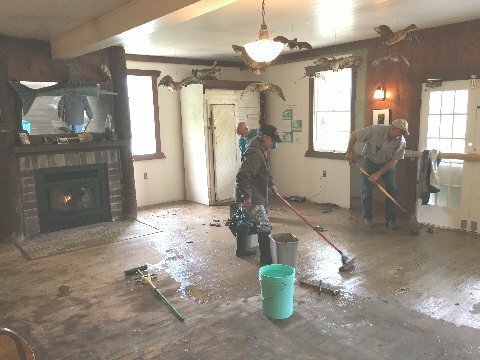 Working hard on the floor surfacing in the old lobby room of the Inn, including Tony Gatchalian, Lori Kaye, and Frank Silva (left to right). The now working fireplace is in the background, with the recently completed restored mantle and hearth work done by Lori Kaye. Happy Birthday, Captain Fletcher's Inn! On Saturday, June 6, 2015, we celebrated the 150th year of the Captain Fletcher's Inn. What a festive occasion! 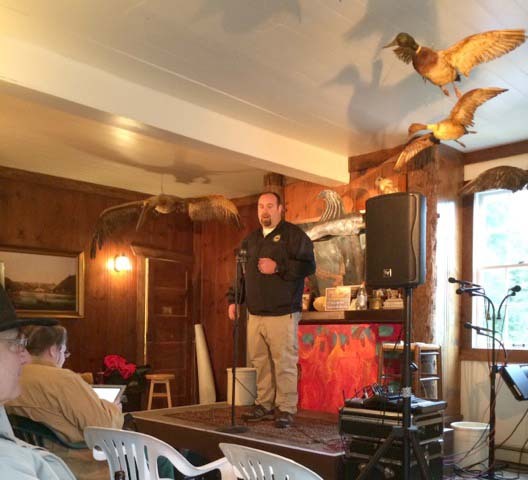 Mendocino State Parks District Superintendent, Loren Rex, welcomed the crowd and cited the many achievements that led to preserving this 1865 structure. NSCR President, Jim Martin, and Vice President, Pete Kalvass, spoke about recent restoration work and future projects such as constructing an ADA compliant ramp. 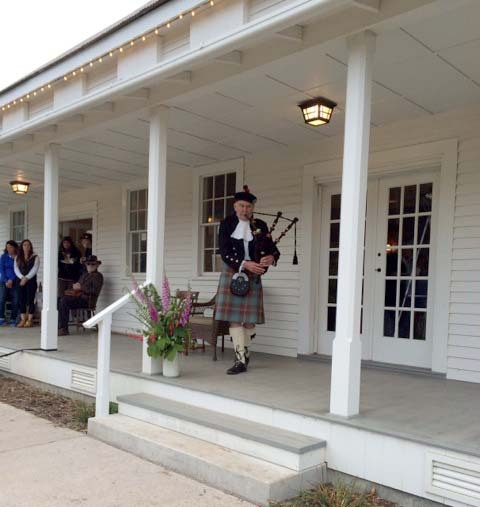 Visitors enjoyed touring the building and joining in the festivities which included bagpiping and a concert featuring ALL ABOUT SALLY and GOFORTH & KROLL. Our fourth annual Cleanup Day on Saturday, May 30th, 2015 was a great success, thanks to all the volunteers who showed up to help with the many cleanup projects. The day ended with a well desrved and delicious picnic lunch sponsored by Mendocino Savings Bank. Our third annual Earthday Cleanup and Fundraiser for the Inn was held on Saturday, May 31, 2014. Work parties were busy in the morning from 9 to noon doing trash clean up, invasive species removal and control, and work on a long list of other projects. Including a CCC crew that helped us make substantial progress, and lots of local volunteer muscle who installed an interpretive display of historic artifacts, painted, and made progress on the upstairs of the Inn. A free bbq was served to volunteers at noon, with fixin’s supplied by Savings Banks of Mendocino. Volunteers on the front porch after the morning cleanup in 2014. In the afternoon, the Inn was open for tours with silent auction items generously donated by local merchants, restaurants and artists. And for the first time, the Inn was open for dinner and a live concert, with beer and wine generously donated by local breweries and wineries, served on the original bar from the Inn. The evening performances were pulled together by Pattie Dematteo of Mendocino Stories and Music, and feature Lenny Laks with Marc Gauche, The Ukeholics, and Marcus McCallen. The Inn was alive again with music, and a good time was had by all. Thanks to all the volunteers, donors, and musicians who made this a great event! 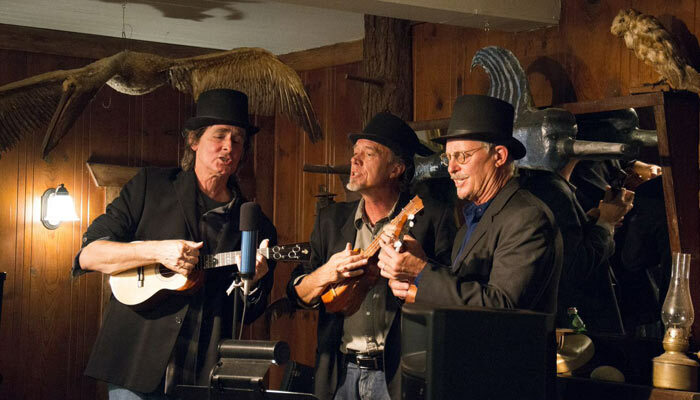 The Ukeholics performing inside the INN in 2014. 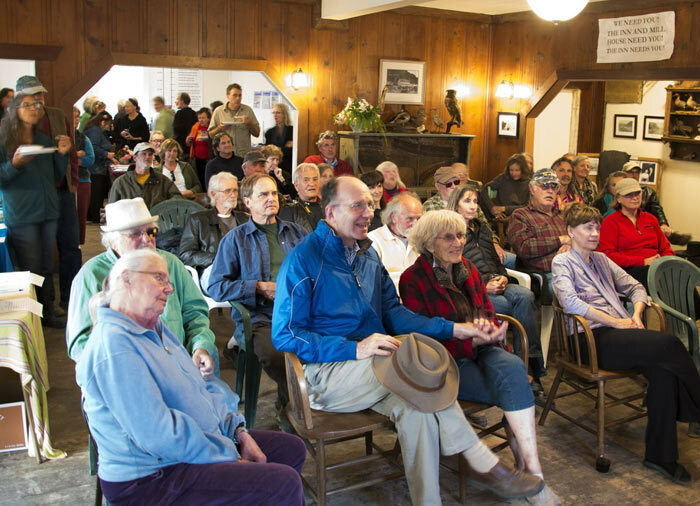 The crowd enjoying the evening concert inside the INN in 2014. The second annual Earthday Cleanup was held on Saturday, May 4, 2013. We had a great crew of volunteers using the Inn for the first time as our base camp. We continued to make progress on invasive species removal, planted native species, painted the two cottages east of the Inn, washed windows, painted interior walls, and cleaned up trash from the beach and estuary. With a great a great bbq provided again by Savings Bank of Mendocino County. Thanks to all our volunteers and supporters! The first annual Earthday Cleanup at Navarro-by-the-Sea was held on Saturday, April 14, 2012. The entire NSCR Board and over 30 volunteers participated in all day shifts, with a noon bbq provided by Savings Bank of Mendocino County. Volunteers filled an enormous dumpster with trash and debris, as volunteers worked on invasive species removal, cleaning and demolishing unused structures, reorganizing stored materials, and painting the kitchen of the historic Mill House. Thanks to the Hospitality House of Fort Bragg, members of the California Conservation Corps, and all the volunteers who made the cleanup a great success! Seventh Annual Public Open House of the Historic Mill Company House was held on Saturday, August 6, 2011. Homemade “Quilts of the Coast” were displayed for the first time throughout the Mill House, and in the barn across the street, an amazing display of talent organized by Charlotte Saunders. This was the first time the barn has been open to the public, and in addition to the beautiful quilts, artifacts from the original town of Navarro were on display as well. Live music was again performed on the front porch by Marcus McCallen and John Bush, enjoyed by folks eating grilled sausages and fixings prepared by Ericha Heinsohn-Sevy, Lisa Rambo and Pete Kalvass. Kathleen Cameron kept track of the donations inside, along with a selection of tasty deserts and treats. And Chuck Saunders managed the front porch, with abalone planted with succulents from the coast. And we had more silent auction items up for bidding this year than ever before. Thanks to all the volunteers and donors who made this a great event. Our fabulous donors this year included: Albion River Inn, Anderson Valley Brewing Co., Boonville Hotel, Brutocao Cellars, Cafe Beaujolais, Elk Garage, Greenwood Ridge Vineyards, Goldeneye/Duckhorn, Husch Vineyards, KZYX and Z, Little River Inn, Lula Cellars, Mendocino Café, MacCallum House, North Coast Brewing Company, Pine Ridge Vineyard, Queenie's Roadhouse Café, Savings Bank of Mendocino County, and Stanford Inn! We couldn't do it without all your support! On Saturday, May 21, 2011, the Kelly House Museum presented a reenactment of historic characters buried in Hillcrest Cemetery, in Mendocino. The presentation featured Bridget Fletcher, Captain Fletcher’s first wife, who is buried at Hillcrest. Although Captain Fletcher is buried at Little River Cemetery, both Bridget and Charles Fletcher were featured in the cemetery tour, with a sweet reunion script written by NSCR Board member Kathleen Cameron. Sixth annual Public Open House of the Historic Mill Company House was held on Saturday, August 14th, 2010. Open house and tour of this historic building was attended by over 500 visitors, open only once a year during our annual open house. Historic photographs of the original town of Navarro were available for viewing, along with information on our progress in saving the historic Captain Fletcher's Inn. Recent photographs by Brent Anderson and Nancy Barth were on display. Live music was performed by Marcus McCallen and John Bush. Thanks to these artists and our other sponsors including Albion Inn, Fensalden Inn, Harvest Market, Ledford House, Navarro Vineyards, and Savings Bank, for making this such a successful event! Official Ground Breaking Ceremony for the Navarro Inn Stabilization Project was held on Saturday, May 29, 2010 in front of the historic Inn. Live music was performed by Ken Smith and a number of speeches made before a large crowd of supporters, followed by light refreshments and tours of the historic Mill House. Speakers for the day included: Ms. Mimi Morris, Executive Director for the California Cultural and Historical Endowment, Mr. Blaine Lamb, Chief, California State Parks Division of Archaeology, Museum and History Division, Ms. Marianne Hurley, Historian, California State Parks, Mr. David Colfax, 5th District Supervisor, Mendocino County, Jan Duncan Vaughn, great, great grandaughter of Captain Fletcher, Mr. Pete Kalvass, Board Member of NSCR, and Mr. Jim Martin, Board President of NSCR and Project Manager for the Inn Stabilization Project. Fifth annual Public Open House of the Historic Mill Company House was held on Saturday, June 27th, 2009. This year, the Open House included a benefit exhibit of plein air landscape paintings installed in the Mill House. Five local award-winning artists - Carolyn Hagopjian, Eleanor Harvey, John Hewitt, Suzi Marquess Long, and Deborah Nordwill - showed paintings of Navarro Beach and the surrounding coastline. Thanks to these artists and our other sponosors including Albion Inn, Fensalden Inn, Harvest Market, Ledford House, Navarro Vineyards, and Savings Bank for making this such a successful event! Benefit Performance for NSCR on Saturday, May 2nd, at the Garden Room of the Mendocino Hotel. 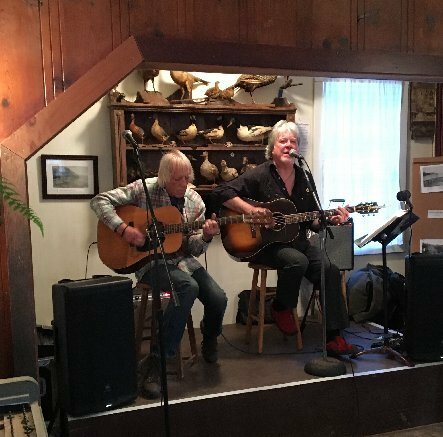 A packed crowd in attendance enjoyed a great dinner while hearing stories and music of Mendocino Coast, generously put together by Pattie DeMatteo as part of the Mendocino Stories and Music Series. All proceeds went to NSCR’s efforts to save the Inn. Thank you Pattie and all the performers! Second Public Workshop on the draft Specific Plan was held at Fensalden Inn on November 17, 2008. Public and California State Parks staff in attendance, together with representatives of NSCR and the consultant preparing the Specific Plan, 2M Associates. The major components of the draft Specific Plan were described, and comments were taken from the public and staff. The public comment period on the draft Specific Plan was held open until January 18, 2009. Fourth annual tour of the Historic Mill Company House on August 9th, 2008. Thanks to our sponsors for their generous donations to the event, including Albion Inn, Fensalden Inn, Harvest Market, Ledford House, and Navarro Vineyards, and to the dedicated efforts of the Navarro-by-the-Sea Center Board and volunteer docents who made the event so successful. First Public Workshop on the draft Specific Plan process was held at Fensalden Inn on May 22, 2008. Public and California State Parks staff in attendance were updated on the progress of the Specific Plan and grant from CCHE, major constraints were summarized, and options for future use reviewed by the consultant. This was followed by questions and input from the public and State Parks staff. Input received during the workshop will be considered as part of refinement of the Specific Plan. Third annual tour of the Historic Mill Company House on August 11, 2007. The event continues to be popular with local and regional visitors, with an attendance of over 300 people. Thanks to our sponsors for their generous donations to the event, including Fensalden Inn, Harvest Market, and Navarro Vineyards, and to the dedicated efforts of the Navarro-by-the-Sea Center Board and volunteer docents who made the event so successful. Tour of the historic Navarro Mill Company House, Navarro Beach, July 15, 2006. Over 300 people toured the house and enjoyed historic photographs of the Navarro Mill and Capt. Fletcher's Inn. Month of April, 2006: An exhibit of selected original paintings of Navarro-by-the-Sea, Mill House, and Navarro Beach were on display at the Mendocino Art Center, located at 45200 Little Lake Road, Mendocino. Month of October, 2005: An exhibit of selected photographs of the historic town of Navarro (by the Sea) provided by The Charles Fletcher Society and Navarro-by-the-Sea Center for Research displayed at the Mendocino Art Center. Tour of the historic Navarro Mill Company House, Navarro Beach, June 4, 2005. First public tour of house was attended by almost 300 visitors.